Dickinson Square West, Philadelphia is a neighborhood in South Philadelphia bordered by neighborhoods Queen Village to the north, Whitman to the south, Pennsport to the east and Passyunk Square and East Passyunk Crossing to the west. The neighborhood was previously referred to as "Dickinson Narrows," but was officially reestablished as "Dickinson Square West" in 2013 by the Registered Community Organization, Dickinson Square West Civic Association, located within its boundaries. Long before William Penn and the founding of the city of Philadelphia, or even the arrival of Swedish settlers, the Lenni Lenape Indians claimed the land they called Weccacoe (pleasant place), now known as South Philadelphia. In 1638, Weccacoe became part of New Sweden when the early Swedes established Fort Christina (now Wilmington, Delaware) and settled along the Delaware River as far north as present day Trenton, New Jersey. The Dutch briefly claimed control of what is now southeastern Pennsylvania from the Swedes in 1655, but the land was quickly ceded to the British, and in 1682 the king of England granted a land charter for what is now Pennsylvania to William Penn. Penn renamed Weccacoe Southwark, after a neighborhood in London, England. Penn's new city of Philadelphia quickly grew along the Delaware River waterfront and spilled over its original southern boundary of Cedar Street (now South Street) by the early 18th century. By 1687, the Southwark District (now South Philadelphia) was divided into two townships, which retained their original American Indian names, Moyamensing (pigeon droppings) and Passyunk (in the valley). Provincial secretary Richard Peters noted the dramatic changes in Southwark's appearance as early as 1743, when he wrote to Governor Thomas Penn,"Southwark is getting greatly disfigured by erecting irregular and mean houses; thereby so marring its beauty that, when he shall return, he will lose his usual pretty walk to Wiccaco." Peters may have been referring to the wood-framed buildings that were common throughout Southwark. Whole blocks developed seemingly overnight; wooden houses were cheaper to construct, but harder to maintain. Newcomers in the early 20th century continued to move farther south. This is evidenced by the building of Mt. Sinai Hospital (recently demolished) in 1921 by Russian Jews between 4th and 5th streets along Reed street, between the community’s initial center at 5th and Bainbridge streets and the area south of Snyder where it would relocate. By World War I, 7th Street, mostly south of Tasker Street, had become “a shopping mecca,” where Jewish merchants sold anything that could be bought. It would become the major artery of the Jewish neighborhood in South Philadelphia, surrounded by important community centers like the Workmen’s Circle on 6th Street and Tasker Street. After World War II, many of South Philadelphia's ethnic enclaves began a long and steady decline as the children of new immigrants left the neighborhood for other parts of the city and nearby suburbs. Dickinson Square West is a narrow, two-block-wide strip of land stretching from Washington Avenue on the north to Snyder Avenue on the south from 4th to 6th streets. It came into existence mainly because of the city's zoning code, which formalizes the role civic and community associations have historically played in reviewing and approving requests for zoning variances. Dickinson Square West is a unique and exciting part of that patchwork and is quickly becoming a high point of the Philadelphia real estate market. The area imbibes and accentuates all of the greatest attributes of South Philadelphia’s extraordinary charm, which is emphasized by its selection of parks, playgrounds, small businesses, and restaurants. Real estate site Redfin ranked it only behind San Diego’s El Cerrito neighborhood on their “Hottest Neighborhoods of 2015” list. Vare-Washington School (K-8), 1198 S. 5th Street. Moore Street Community Garden, 1736-1738 S. 5th Street. Sacks Playground, 400 Washington Avenue. Manton Street Park and Community Garden, 405 Manton Street. Free Library of Philadelphia, Southwark Branch (opened 1912, now Philadelphia Overseas Chinese Association), 1108 S 5th Street. Vare-Washington School, National Register of Historic Places (added 1986), 1198 S. 5th Street. Mount Moriah Temple Baptist Church, 410 Wharton Street. Russell Tabernacle C.M.E. Church, 518 Wharton Street. Gilead Praise & Worship Center INC, 1837 S. 5th Street. ^ "About QVNA". Queen Village Neighbors Association. 2011-05-22. Retrieved 2017-08-09. ^ a b "Dickinson Square West Civic Association | Serving 4th-6th and Washington to Mifflin Streets in South Philadelphia". WordPress.com. Retrieved 2017-08-08. ^ a b "PhilaPlace - From Weccacoe to South Philadelphia: The Changing Face of a Neighborhood". www.philaplace.org. Retrieved 2017-08-08. ^ "PhilaPlace - South Seventh Street". www.philaplace.org. Retrieved 2017-08-08. ^ "The hottest neighborhood you've never heard of: Dickinson Narrows". www.phillyliving.com. Retrieved 2017-08-08. ^ "Dickinson Narrows Philadelphia Real Estate Homes & Condos for Sale". Philadelphia PA Real Estate, Homes & Condos for Sale. Retrieved 2017-08-08. ^ Real-Time, Redfin (2015-01-22). "Redfin Predicts the Hottest Neighborhoods of 2015 - @Redfin". Redfin Real-Time. Retrieved 2017-08-08. ^ "The Vare-Washington School". Retrieved 2017-08-08. ^ "Moore Street Community Garden Joins NGT". www.ngtrust.org. Retrieved 2017-08-08. ^ "Making A Molehill Out Of Mt. Sinai | Hidden City Philadelphia". hiddencityphila.org. Retrieved 2017-08-08. ^ "Free Library of Philadelphia, Southwark Branch, 1108 South 5th Street , Philadelphia, Philadelphia County, PA". The Library of Congress. Retrieved 2017-08-09. ^ "Asset Detail". npgallery.nps.gov. Retrieved 2017-08-08. 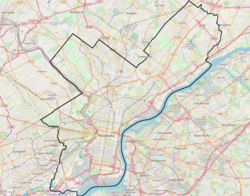 As a consolidated city-county Philadelphia is its own county seat. This page was last edited on 1 March 2019, at 15:46 (UTC).